There are many reasons why someone may lose their teeth, from severe decay and damage to serious infection. However, if you find that you are missing a large number of teeth in your upper or lower jaw, you will undoubtedly need to have them restored. Dentures are the traditional treatment for replacing lost teeth. When you think of dentures you probably think of false teeth placed in a glass of water overnight. While modern removable dentures still need to be soaked in cleaning solutions, you will be pleased to learn that newer designs used in dentures make them more comfortable and natural in appearance than ever before. Better still, patients now have the power to decide which type of denture suits them best. The two most common types of denture are known as fixed and removable dentures. Here is what you need to know about each, including the all-important differences between them. Removable dentures are the most widely known variety of denture. The prosthetic teeth are placed into a gum-colored mold that fits over the top of your natural gums. When you place your removable dentures in each day, you must first place special denture adhesive onto the denture and gums to glue your dentures in place. 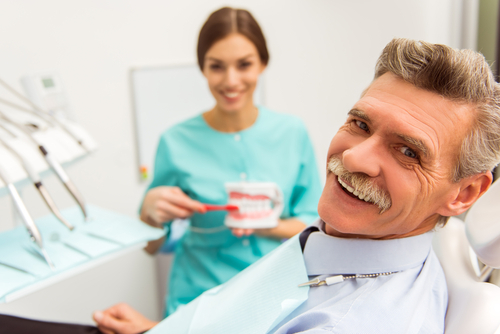 Unfortunately, many wearers find that the adhesive is not all that reliable, and it is not unheard of for the denture to slip and move around when you are talking, laughing, or eating, and this can cause embarrassment. You may find that you avoid chewy or hard foods because you are concerned about the risk of your denture coming out. Many patients also find that their dentures become uncomfortable during the day as the acrylic mold rubs against their gums and the soft tissues inside their mouth. At the end of the day, your removable dentures must be taken out for cleaning. Removable dentures are fairly fragile, so you should hold them over a sink of water or folded towels while you brush them. You will then need to place them in a glass of water with a denture-cleaning tablet for even further cleaning while you sleep. Dentures are an arch of prosthetic teeth that are attached to artificial gum tissue that sits over the top of your natural gums. However, the way in which fixed dentures are secured is different than conventional dentures. This is because fixed dentures use implant technology to attach them to your mouth. Implant technology has drastically improved the dental industry. Each titanium implant is inserted into the jaw bone at pre-determined locations of the dental arch and the bone is stimulated and left to grow around it. This creates a permanent anchor to which your fixed denture can be attached. Fixed dentures can only be placed and removed by a certified dentist. However, while you are wearing them, they are extremely strong and durable. They will not slip or move around like conventional dentures, and you can enjoy a range of foods without worrying about them coming loose. A great investment. Fixed dentures could last upwards of 20 years. If you have further questions about the differences between fixed and removable dentures, call Boss Dental today at 361-245-5400 to learn more.